A Smoothie is a fruit drink, which originates in the US*, where milk bars started selling them in the 20s and 30s. They became very popular in the late 70s and 80s, with the increasing popularity of fitness and sports. They can contain crushed ice, milk, yogurt, frozen yogurt or ice cream, which gives them a thick and creamy texture. The possibilities are very wide. The great thing about them is that they are done in minutes and provide a quick and refreshing breakfast. The book ‘smoothies and juices’ offers a wonderful collection of sweet and savoury drinks for all times of day! Pour the two yogurts into a food processor and blend gently. Add the orange juice and mix until well combined. Add the strawberries and banana and process until smooth. 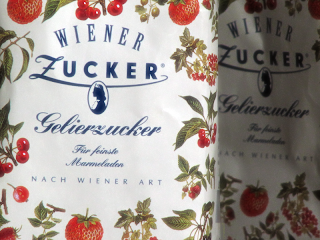 Pour the mixture into tall glasses and decorate with slices of fresh orange and whole fresh strawberries. 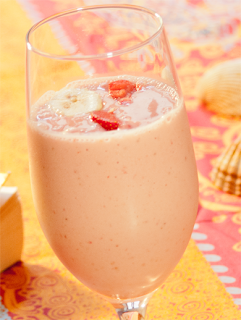 *the Indian Lassi drink is basically also a smoothie, but I could find no connection that the American smoothie originates from the Indian beverage. Striezel (plaited bun) is a typical and popular Austrian breakfast bread. It is very similar to the Jewish Challah, but includes milk. Austria has always been the European melting pot, due to its position in central Europe. Until World War I Austria used to be a large empire and the impacts from Hungary, Italy, Bohemia and Turkey but also strong Jewish influences are the things that make Austria unique. Breakfast is an important meal for us Austrians. Breads (Striezel, rolls or dark bread) are eaten either with butter and jam or with ham and cheese and very often a soft boiled egg. Coffee is extremely popular and especially Vienna is famous for its coffeehouses, where friends meet, people read their newspaper or business meetings are held. Put the flour into a bowl and make a hole in the middle. Mix the milk together with the yeast and pour into that hole. Sprinkle with some flour and let it rest for about 10 minutes until the mixture starts to show bubbles. Mix everything together with the remaining ingredients (but the last two) and knead thoroughly until the dough is smooth and comes off the side of the bowl. Let the dough rest at a warm spot for about 1 ½ hours or until double (an ideal spot for me is always the oven at the lowest temperature possible). 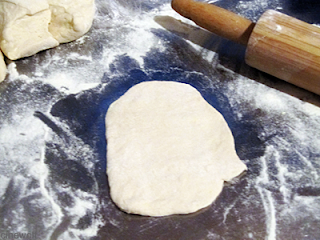 Divide the dough into three equal parts and roll them to equally long ropes. Form a braid. As you can see in the picture, I am not very good at that part, but I must say I care more for the taste than the look. Put the bread on a greased baking sheet and let it rise once more. Bake for about an hour until golden brown. Best served with fresh butter and apricot jam or honey! This is a wonderful, easy-to make hearty breakfast or early lunch. Preheat the oven to 325º F (150°C). In an oven-proof frying pan heat half the oil. Sauté the onion rings and the bell pepper at medium heat until soft. Then remove the vegetables from the pan. In a bowl whisk together the eggs, milk, salt and pepper. Heat the remaining oil in the pan. Pour the egg mixture into the pan and tilt to coat evenly. Cook for 1 minute on high heat without stirring. 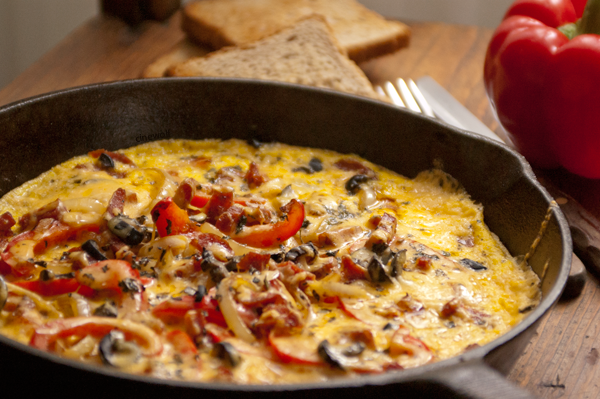 Layer the omelet with the onions, bell pepper, cheese, sausage and olives. Sprinkle with oregano. Put the skillet in the preheated oven and bake for a couple of minutes until the eggs are puffy and the cheese is bubbly. Mali, a former colony of France but independant since 1960, is one of the poorest countries in West Africa. Especially the North is suffering from an unfortunate climate with cold winters, few and short rain periods and droughts. This might explain the very few ingredients for those little cakes, which are so easy to make that you can prepare them still half asleep. This recipe is proof for the fact that tasty meals do not have to be complicated or include a long list of ingredients. Combine the flour with the water and the bananas to get smooth batter. Season with a little bit of nutmeg. Heat the oil in a pan and drop a spoonful of batter into the pan, about the size of a small fist. Bake on each side until the cakes are golden brown. You can serve them as they are, dust them with icing sugar or serve with some maple syrup. Tip: if you have ripe bananas and don't need need them right away, mash and freeze them (for up to 3 months). You can use them for this recipe, but also for banana bread, muffins, cakes and so on! 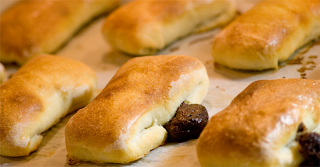 When I was little my family spent every summer in the South of France and my dad went every morning for fresh baguette and croissants, and sometimes for pains au chocolat, those little pastries filled with chocolate. Whenever I make these, I'm reminded of carefree summers, sun and swimming. The following version is made with a yeast dough, which is quite easy to prepare. 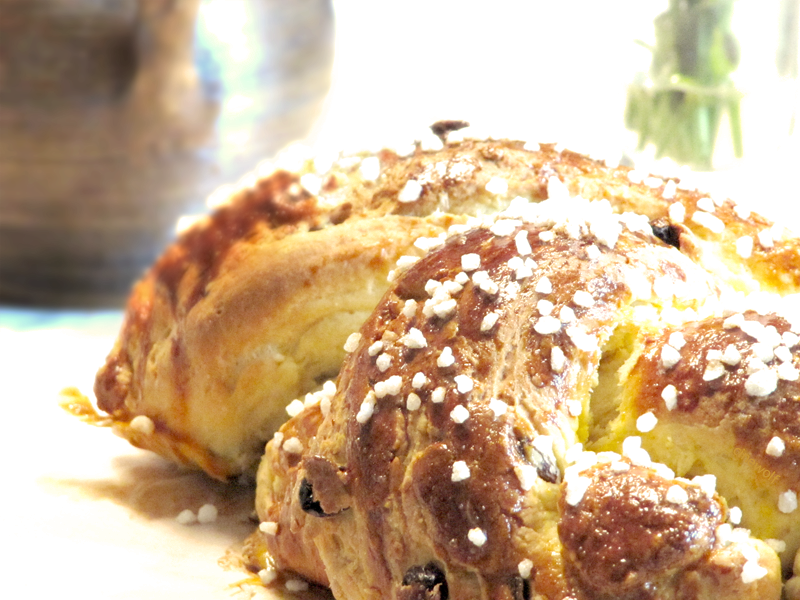 You could also use the same pastry dough as for croissants, a recipe for which will follow soon! You could prepare the dough the evening before and let it rise overnight, saving you time in the morning! 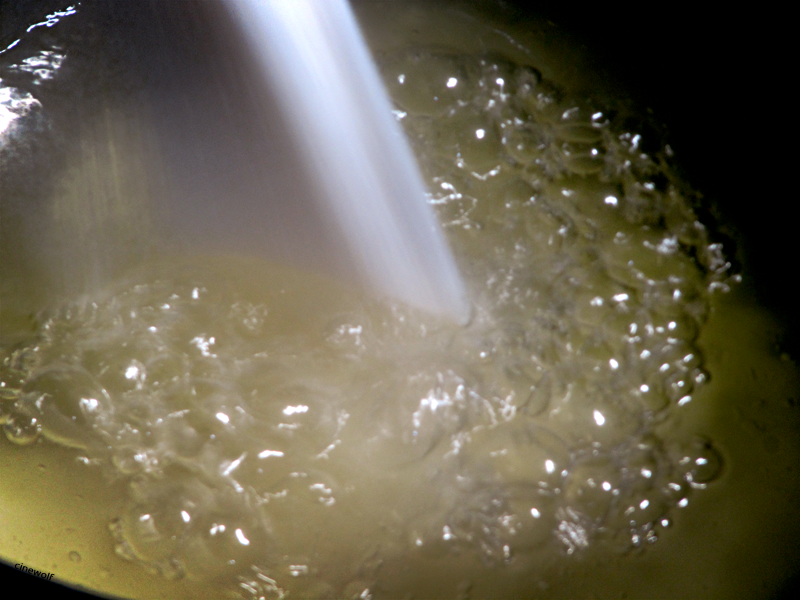 Dissolve the yeast in the milk-water mixture and combine with the flour and salt to soft dough. Knead the dough for some minutes, with a mixer or by hand, then place it in a bowl, cover with clingfoil and let it rise at a warm spot until it has doubled in size (or overnight). Punch it down and knead it lightly once more. Divide the dough in 8 equal parts. Roll the pieces on a floured surface to rectangles (or something resembling a rectangle). 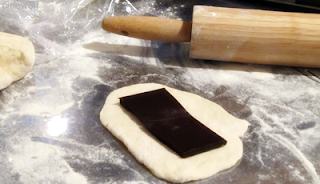 Place a rip of chocolate onto each rectangle, fold to small packages and tuck in the edges. Brush with milk, place on a floured baking sheet and set aside for 20 minutes. Bake for 20 minutes until lightly brown. Dissolve the sugar in the milk and brush the rolls with this mixture as soon as they come out of the oven. They are best served warm! I don’t have a lot of experience with polish food, but one of my favorite writers is Lily Brett, an Australian-American woman with polish roots. Her parents are both Auschwitz survivors, a recurring topic in her books, nonetheless written with such a subtle humor which is just wonderful. 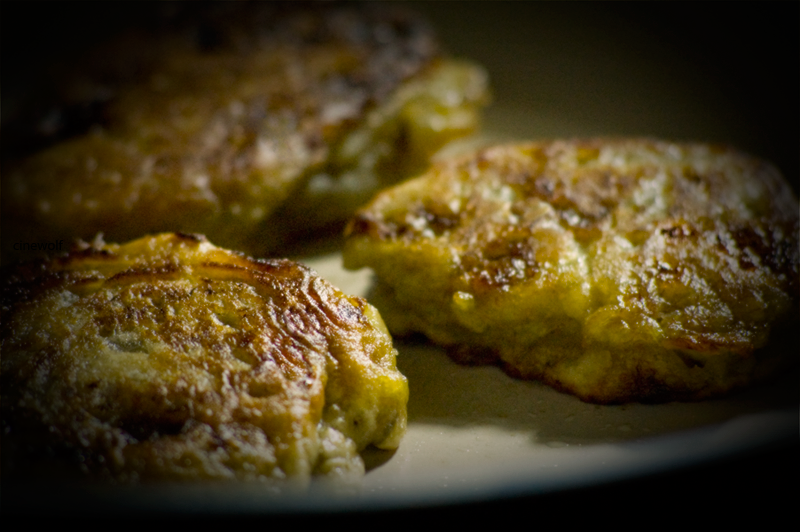 Food is another constant theme in the books, especially in ‘Uncomfortably Close’ (or ‘You gotta have balls’), which even includes half a dozen mouth watering polish recipes at the end. Unfortunately none for breakfast, so here is another one, which I found doing some research. It is easy to make, easy to prepare and tastes really good. The salsa is optional of course! Preheat the oven to 430°F (200°C). Cut the bacon in small pieces and fry in a dry skillet. Remove the bacon and use the fat to grease a baking form of 7x10-in. Grate the cheese and stir together with the curd in a bowl. Beat in the eggs and add the bacon. Finally add the polenta, the flour and the oil and stir to get a smooth texture. Season with salt, sweet and black pepper. Pour the batter in the baking form and smooth the top. Sprinkle with the corn. This part can be done the evening before. In this case cover the form with cling foil and put in the fridge. Take it out the next morning, while heating the oven. Bake in the middle of the oven for about 45 minutes. Serve warm, optional with the salsa below. Stir together all ingredients in a small bowl and salt to taste. Cool in the refrigerator for at least fifteen minutes before serving. This slightly bitter marmalade is perfect for scones or sweet rolls. In my head bitter Orange Marmalade, as well as Grapefruit Marmalade is somehow associated with English breakfast or old fashioned tea ceremonies, but I am not sure about the true origin. If anyone knows more, please to let me know! 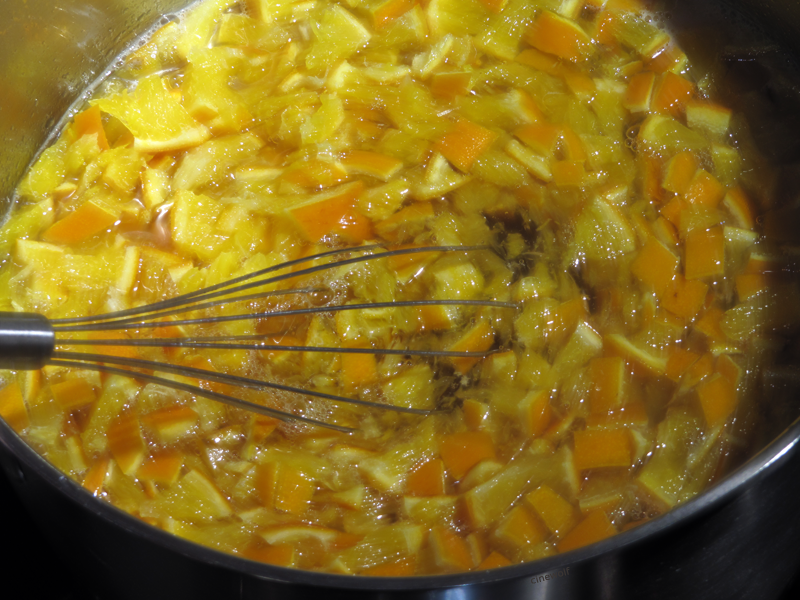 Cook the oranges in the water in a large covered pot for about an hour. Drain, but keep the cooking water. Cut the oranges open, remove the stones very thoroughly. Then cut the oranges into very small pieces. Put the cooking water together with the sugar in a pot on medium heat. 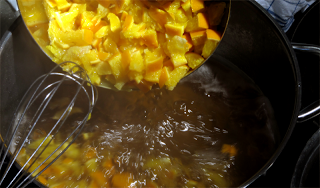 Stir frequently until the sugar is completely dissolved. Turn the heat up to high and let it cook for a couple of minutes. Then add the orange pieces and the lemon juice. When the whole mixture is boiling, turn the heat down to low and let it simmer for 30 to 60 minutes, until it gets the right texture. If some foam builds up while you cook, just remove it. Fill the jam in sterile warm glasses and brush a little of alcohol (Rum, Gin, whatever) onto the lids, just in order to make sure they are sterile. Close, put them upside down for a couple of minutes and then turn them around. A note on how to sterilize glasses: the easiest way is to wash the glasses and lids in the dishwasher, remove them while still hot and then fill a little bit (some tablespoons) of alcohol in, close them and shake thoroughly so as the alcohol can spread everywhere. Then drain and put them upside down on a tea towel, so that the rest of the alcohol can dry out. *I use special sugar for cooking jams and marmalade (see picture), but this is not necessary. 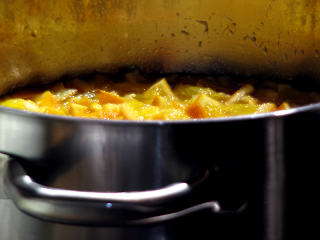 I would have something to thicken the marmalade with though, just in case! copyright 2011 Katrin Zöttl. Powered by Blogger.